It’s impossible to walk through a hospital without marveling at the advances in Western medicine that can add years — if not decades — to a person’s life. Often though, a person feels a burning desire to heal not just their body, but also their mind and spirit. A longing exists for optimal health and holistic healing. That’s Where Calm Waters Holistic Healing Can Help. The founder of Calm Waters, Nancy Lishack, M.Ed., completed her training at both the Barbara Brennan School of Healing and Alice Domar Center for Mind/Body Health. Nancy is the only healer in Western Pennsylvania to study with both Dr. Brennan, a world-renowned healer, teacher and former NASA physicist, and Dr. Domar, one of the country’s top women’s health experts and creator of an innovative mind/body program for fertility care. Calm Waters offers a comprehensive integrative approach that helps clients achieve wholeness and move forward in their life’s journey. People dealing with fertility issues know that stress is their constant companion. 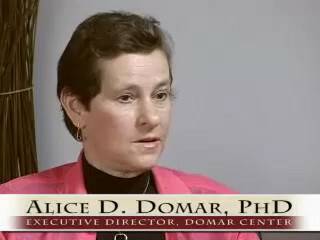 Dr. Alice Domar, Executive Director of the Domar Center for Mind/Body Health, Director of Integrative Care at Boston IVF, and Associate Professor at Harvard Medical School, has conducted numerous research studies looking at the relationship between stress and fertility. According to Dr. Domar, “infertile women report equivalent levels of anxiety and depression as (do) women with cancer, HIV status, or heart disease.” Learning to control this anxiety and stress is essential. The Mind/Body Fertility Program at Calm Waters is modeled after Dr. Domar’s program in Boston. Dr. Alice Domar has given Calm Waters Holistic Healing, LLC permission to use her materials. Calm Waters has brought together a group of individuals with unique skills, but one common connection — a desire to help clients grow and heal. Michael is a licensed clinical psychologist with MGM Psychological Associates. He has been devoted to a full-time private practice, providing intensive individual and group psychotherapy for more than 20 years. He originally honed his psychotherapy skills through four years of training at the Gestalt Institute of Cleveland, with an emphasis on both working with individuals and working with body processes. He has been in ongoing training and supervision for many years, through which he has incorporated approaches from Gestalt, Radix, Object-Relations, BioEnergetics, Developmental Character Styles, body-oriented psychotherapies, Jungian archetypes, energy healing and a deep immersion in the mythological teachings of Joseph Campbell. Diane Feliciani has practiced yoga for 15 years. She became a Registered Yoga Teacher (RYT 200 hours) in 2009. In addition, she became certified in Yoga Education in 2011 in order to be able to offer a structured curriculum to the adolescents that she works with as a school counselor. She has also attended yoga-training workshops with Max Strom and Susi Aldous. Diane has taught Stress Reduction Through Mindfulness seminars to teachers as well as business professionals including Nationwide Insurance and K&L Gates. Women’s workshops have included Celebrating Women’s Wisdom, Labyrinth Walks and Journey to the Heart retreat. Moving mindfully and practicing breath-work is the core of her current yoga practice. The program includes an intake/individual counseling session, ten group sessions, three sessions for your partner, lunch for both of you, the participant manual, a book and two CDs. Why do I have to do the individual counseling at all? The initial consult serves a very important purpose and is required for all participants. It provides a chance to meet and to get to know the program group leader and it gives her a chance to know how you are doing and what issues you would like to work on during the program. The final consult is optional but important as it serves to summarize your experience and progress and to set new goals for your health. What time does the program start and can I arrive late? Each group is held on a weekday evening or a Saturday morning. The first half hour of every group is reserved for sharing/support time and is optional. Because this support time is important to those who attend, we ask that participants respect this first half hour if they need to be late by waiting in another area until the time has ended. I’m not a group type person. How touchy feely is this? While there is a half hour of optional sharing time at the beginning of each session, the rest of the time is structured to provide information, i.e., relaxation techniques, nutrition, exercise, etc. Partners are invited to attend three of the ten sessions (but this participation is optional). However, there is great benefit in involvement. Not only do they benefit from techniques taught, such as relaxation methods and the couples’ paired listening exercise, but we also provide one support group session designed specifically for the partners. In addition, they gain key insight to what their partner is really going through. Why is the men’s support group essential? The following articles are from RESOLVE. The National Infertility Association reviews the emotional aspect for a man dealing with his partner’s infertility diagnosis. The three sessions for men have proven to be very beneficial for the men as individuals and the couple as a whole. Most people need to miss a session or two since ten weeks is a long stretch of time. We ask that you not miss more than two. At the first session, a buddy is assigned to you. This person is there not only to support you emotionally during the program should you need it, but also to take notes for you should you need to miss a session. The group leader is also there to answer any questions. I have secondary infertility. Can I participate in the ten-week program and will I feel isolated in the group? We do accept people who have one child into the ten-week program. However, we only have secondary infertility participants if there are two per group. Most groups are limited to ten participants. We combine primary and secondary infertility participants because not enough secondary participants have yet come forward to have a separate secondary group. We match up secondary participants as buddies; in other words, we do not match up one participant who has a child with another who doesn’t yet have a child. Our cancellation policy is three-tiered: 1. Full refund less a $100 cancellation fee will be made if notice of cancellation is received less than 48 hours before intake appointment (first individual counseling session). 2. Full refund less a $200 cancellation fee will be made if notice of cancellation is received anytime after the intake appointment and prior to 48 hours before the program begins. ($100.00 cancellation fee, $100.00 fee for intake appointment) 3. There will be no refunds for cancellations received less than 48 hours before the program begins. Energy medicine has been around for thousands of years. Every culture across the globe at one time utilized energy healing to balance the vital energy flowing within a person’s own body. Western medicine plays a powerful role in today’s world; however, the energy healing from ancient times is still relevant. As a Brennan Healing Science practitioner, Nancy Lishack helps clients create optimal health in body, mind, and spirit. Brennan Healing Science looks at a person more deeply than just physical symptoms. It’s been called an enlightening system of healing that combines hands-on healing techniques with spiritual and psychological processes touching every aspect of your life. This specialized healthcare modality is intended to be integrated with your other healing work, such as traditional medicine or psychotherapy. The first session starts with an interview, to learn the health history and major life stressors that could influence the client’s state of well being. This session usually runs 90 minutes. For all other sessions, which usually run 60 minutes, the client gets into a comfortable position lying on the healing table and a variety of techniques are used to repair the body’s Human Energy-Consciousness System. These techniques are deep, refined, subtle, and powerful. The specific techniques used vary to fit the client’s personal needs. The Brennan Healing Science work helps to clear and charge the human energy field, to remove energetic blocks that may lead to disease and to enhance the body’s natural healing capability. It’s recommended that you drink a lot of water, get plenty of rest, refrain from using alcoholic beverages and from doing strenuous activity for at least 24 hours after a session. Each one-hour session can take place either in Nancy’s office or over the phone. Call to schedule your first appointment at 412-657-3568 or email nancy@calmwatershealing.com. “I had been through a divorce and rebuilding of my life, using traditional therapy to help me navigate that and though by all external appearances I was doing well, internally I was having a great deal of trouble adjusting to the blessings and the challenges my new life was bringing me, never fully able to step forward and experience, nor really enjoy, that way forward. Working with Nancy over the last number of years has allowed me to do that. I have been able to explore what I want and where I am going in a safe and supportive environment. The work has been restorative to me mentally, emotionally and physically, allowing me the insights and room to really grow. This effect has stayed with me as our work has continued, easing the transition into new phases of life. For over a decade, Nancy has made numerous presentations aimed at helping clients embark on a path of healing.